Steve Duck and David T. McMahan: What Are the Functions of Nonverbal Communication? Julia T. Wood: What's a Family, Anyway? Lawrence A. Kurdek: What Do We Know About Gay and Lesbian Couples? Charles J. Wigley III: Verbal Aggression Interventions: What Should Be Done? "Because I like bridges. But seriously, so far it isn't that bad. Kind of pricey, but aren't all textbooks?" 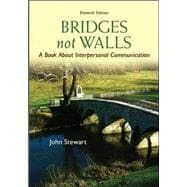 Bridges Not Walls: A Book About Interpersonal Communication: 5 out of 5 stars based on 1 user reviews.